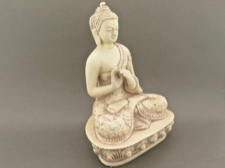 Lovely detail on this bonded stone 5 inch cast figurine. 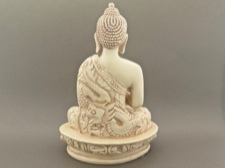 There is a winding dragon and sanskrit lettering around the back of the lotus pedestal, even intricate patterns on his flowing robe. His fingers are carefully set in the dharma teaching mudra. 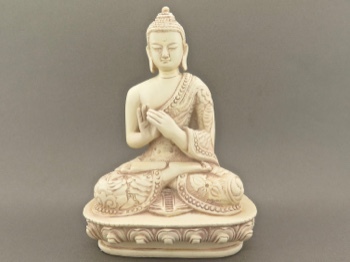 Mudras indicate the function of the Buddha. This mudra, or hand position, symbolizes one of the most important moments in the life of Buddha, when he preached his first sermon after reaching enlightenment. The hands are held in front of the heart, symbolizing that these teachings are straight from the Buddha's heart.